Home is where the heart resides. So, it is of utmost importance that you design and decorate your personal space with some brilliant looking furniture. While the idea of decor is a very vast one and includes all different kinds of fancy furniture, the daily usage ones also require a lot of attention. Beautiful round glass dining tables serve a number of purposes other than just looking good. Furthermore, if it is equipped with smart and modern features, then the joy of dinner even gets better. 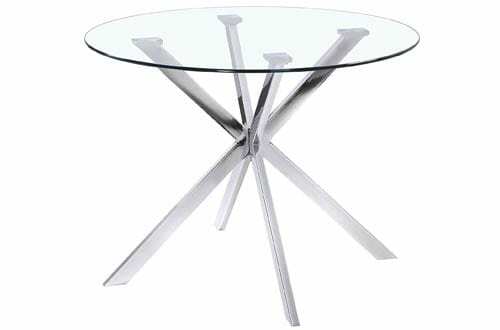 However, it is not easy to choose the perfect one for yourself out of a swarm of round glass dining tables available in the market. Well, there is nothing to worry about! 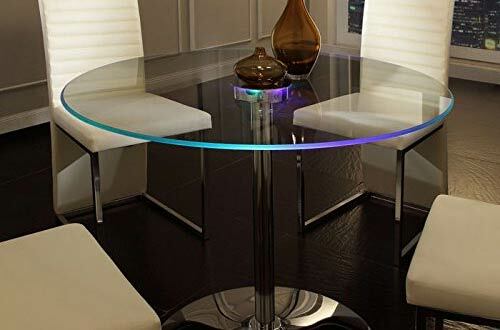 Here is our list of the Top 10 great Round Glass Dining Tables that are designed to deliver premium styling, serve all the purposes, and durable enough to last you a lifetime. 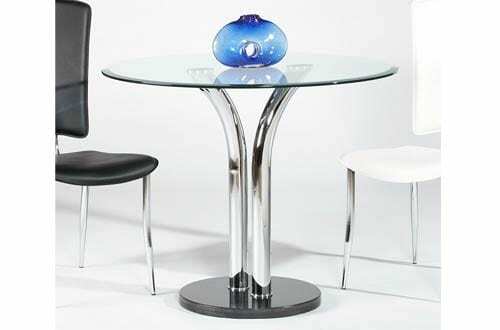 A classic curved design and great durability, this compact Glass Top dining table from Southern Enterprises can be the right addition to your interior. The dark brown colour over the metal construction has a total capacity of 4 persons and is perfect for daily usage. 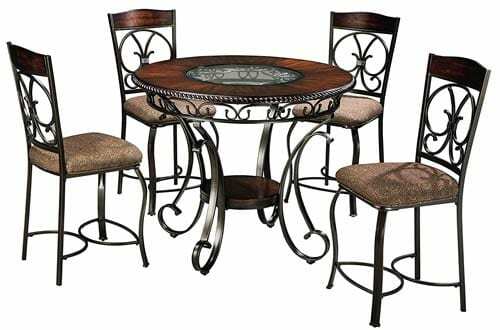 Set it up right in your dining area or the kitchen without any hassle as this will not take up a hefty amount of space. The 8-mm tempered glass and the metal construction are durable as well as easy to clean after every use. The minimalistic design and modern outlook are just what you need in your home for varied purposes. 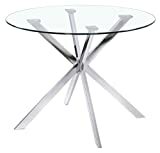 It is a cocktail table fitted with a 0.25” thick top made up of clear glass. Moreover, the finesse chrome base adds to the luxurious looks of the table. 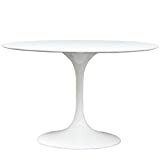 Intelligently designed, this table does not require a lot of room and can be used for both residential and commercial purposes for various occasions. Decorate it or enjoy a cocktail on it, the table will always be the perfect status symbol for you. Though this casual dining table is small in size, it is one of the best ones in the list in terms of design and looks. 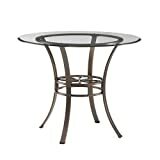 Being made in Malaysia, this round glass dining table comes with a deep cappuccino wood finish. 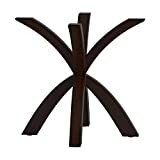 The sturdy structure of the table assures you about its durability as well as longevity. 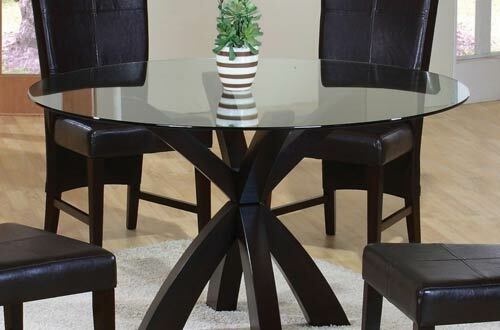 The traditionally designed dining table has a beautifully sculpted pedestal base which further enhances its looks. 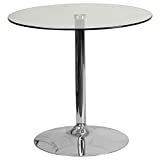 It is obviously one of the most modern looking round glass dining tables you can get in the market. The table is created with really durable materials. The stainless steel construction along with the steel stalls adds uniqueness and increases the durability with great margins. 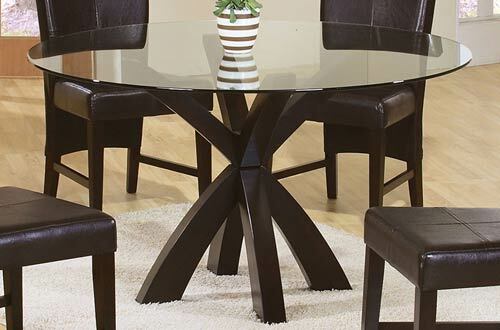 Add this to your dining area, and let the glamour of this modern looking dining table do the rest. It is up-to-date in styling, extremely durable and has a maximum capacity of four persons with ease. Another supremely styled and designed table on the list, this black and fine looking table from the house of Furniture of America is designed to turn some heads. The modern styling fitted with 5 mm tempered glass top is made purely out of wood and wood veneers. Moreover, the durability of this piece is never in doubt and it also has gorgeous features. 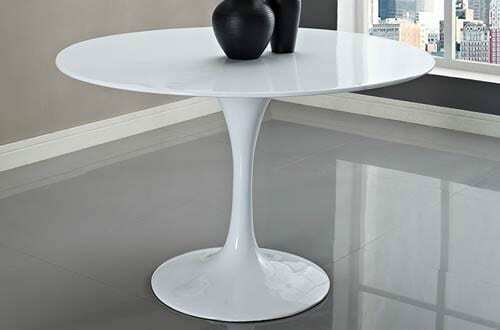 Welcome this modern looking table in your home and admire the sleek sophistication inspired by contemporary styling. 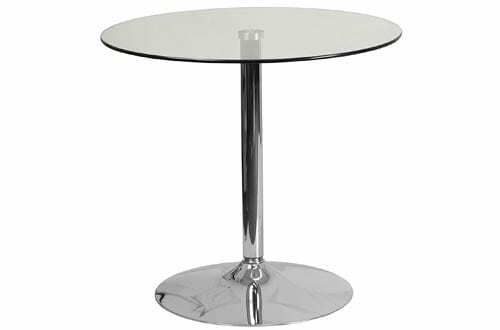 Being one of the best looking round glass dining tables to choose from; it can be a perfect inclusion to your home if you are looking for a compact, sturdy, durable and premium looking dining table. Though the glass top does not come in a package with the pedestal, but the astounding colour tone of the total construction looks quite appealing. Moreover, the uniform design can comply with any kind of decor and readily adds a new charm to your kitchen or dining area. Make your dining experiences more engaging and enjoyable with this elegant table. A fine piece of architecture inspired by the classic design, the scrolling metal legs and dark wood finish can be a perfect addition to your contemporary interior decoration. The versatile design that has a vintage look and trust of big name, Ashley Furniture, it is a dining table suited to serve all sets of purposes. Besides looking fantastic as if the table straight came out of a fairytale, it also functions in a fabulous way and the durable materials such as manmade wood, metal base and etc are meant to last a generation. 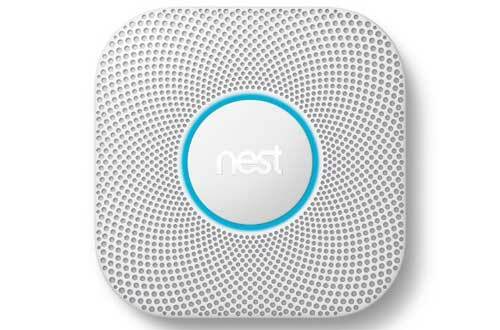 The design is compact and sits at any place of your house with ease. Outstandingly designed and crafted in a modern way, the Fiberglass Dining Table from Modway Lippa has a supreme finish and premium styling. The Aluminium base offers stability and durability without taking up a lot of space. The seamless organic shape is compact and appropriate for all modern interiors. Enjoy all your meals on this table as it is scratch and chip resistant apart from being the perfect dinner table for all occasions. 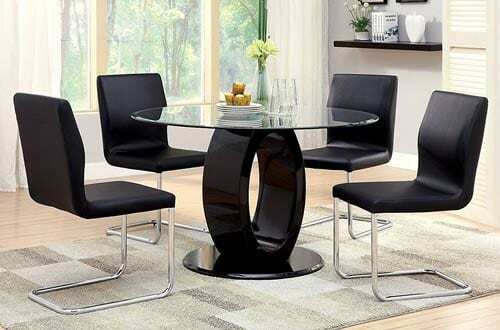 The looks and design of this Round Glass Dining Table are topnotch and modern in every aspect. Clear Tempered glass sitting on top is both durable and appealing at the same time, whereas the chrome middle support base adds to the excellence. One of the best sellers in the market, this is certainly a choice a great buying choice if you are on the lookout for something fancy, beautiful, compact, having a contemporary design and durable for an elated dining experience. 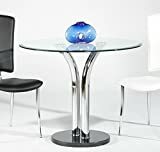 When you are looking at the number one product on our list top of round glass dining tables, you can be certain about actually witnessing the best table combined with exquisite features, compact design and durable construction. The LED lighting on the brim adds excellence and makes it look luxurious. Innovation and intelligence are the unique selling points of this product. Plus, its engaging design promises to make your dinner time a truly special one. Celebrate every meal with your loved ones and create an ambience that you will cherish for long. The metal and chrome finish adds luxury and durability to this amazing piece. 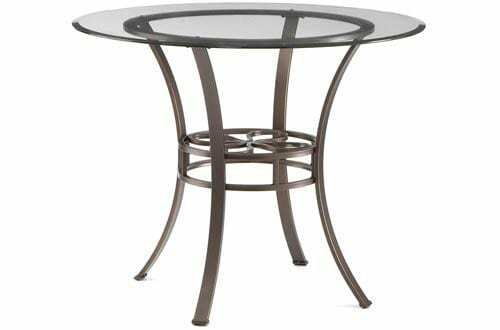 Increase the elegance of your dining room and have a relaxing meal, these round glass top dining tables are an excellent choice for your home. Do not forget to invite your friends to a feast and enjoy a happy meal by dining on any of these tables.